Prof. Crull's TED-x talk on "Finding truth in the age of information"
Prof. Morton's article in Aeon: "Engines of democracy"
Prof. Pigliucci gives ethical advice to Vice President Pence... on Comedy Central! Prof. Kidd is interviewed by the blog of the American Philosophical Association. Prof. Ritchie is a guest on Full Frontal with comedian Samantha Bee. Prof. Weissman recently received the Founders' Medal, a life-time achievement award, from the Metaphysical Society of America. His book, Spinoza's Dream, is published by Walter De Gruyter, Berlin. Check the page and videos! 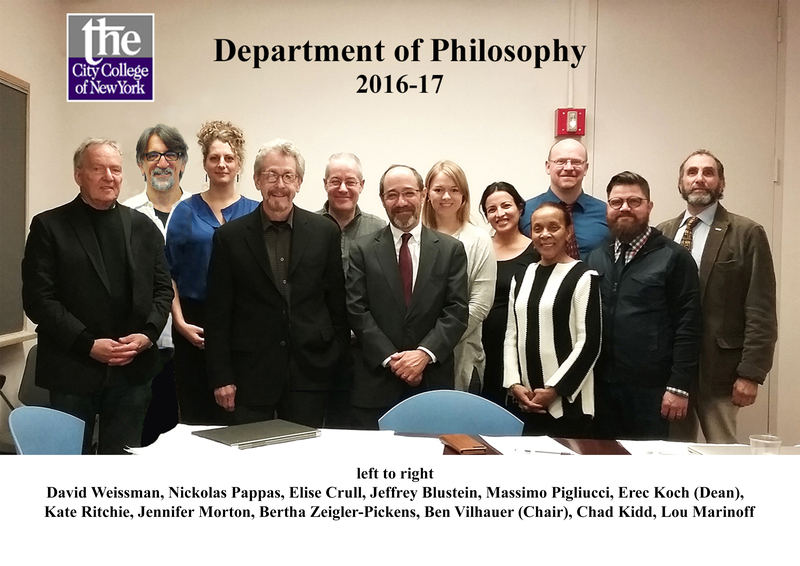 On this site you will find a lot of information about Philosophy at CCNY, our courses, our faculty's many books, the Department's projects, and our outreach efforts - all under different tabs on the left menu. And of course be sure to follow us on Facebook and Twitter!